The glass showcases in this high end jewelry store agree with their luxurious contents. These are Bold showcases with a spectacular customization, namely thicker side walls. 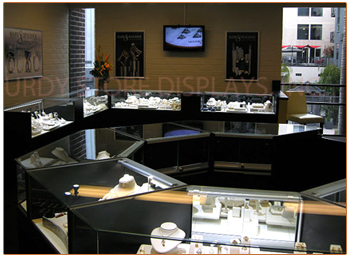 A combination of outside corner showcases and standard straight showcases create a marvelous kiosk circle in this high end jewelry shop.